Dog Almighty is run by Rachel Smith. She started dog walking professionally in 2007, after leaving a career in education and teaching, to spend more time with her own dogs. Over the years she has developed a holistic approach to dog care, focusing on modern force free training; behavioural issues; mental stimulation; breed specific requirements; injury prevention and rehabilitation; physical/medical issues; rescue dogs; sporting dogs; canine law; health and nutrition. Each long walk with Rachel will take in the sights, smells and sounds that every dog loves — fields, water and woodland will ensure your doggy is in seventh heaven! Dogs can enjoy the freedom of running free and enjoy play and socialisation with other dogs. You can relax, safe in the knowledge that Rachel’s skills are used to create an encompassing care package – with action packed, energetic, varied and stimulating walks! Rachel had run a website to promote here business for many years (since 2009). The content and design, which had been tweaked little a bit over the years, was very dated. More importantly the site didn’t work too well on modern devices, such as mobile phones, and was penalised in Google searches because of this. She now has a modern website built using WordPress and sufficient knowledge to keep it up to date on a regular basis in the future. The new Dog Almighty website developed by AWP was launched on Tuesday 15th November 2016. The new MAD First Aid Limited website is live! 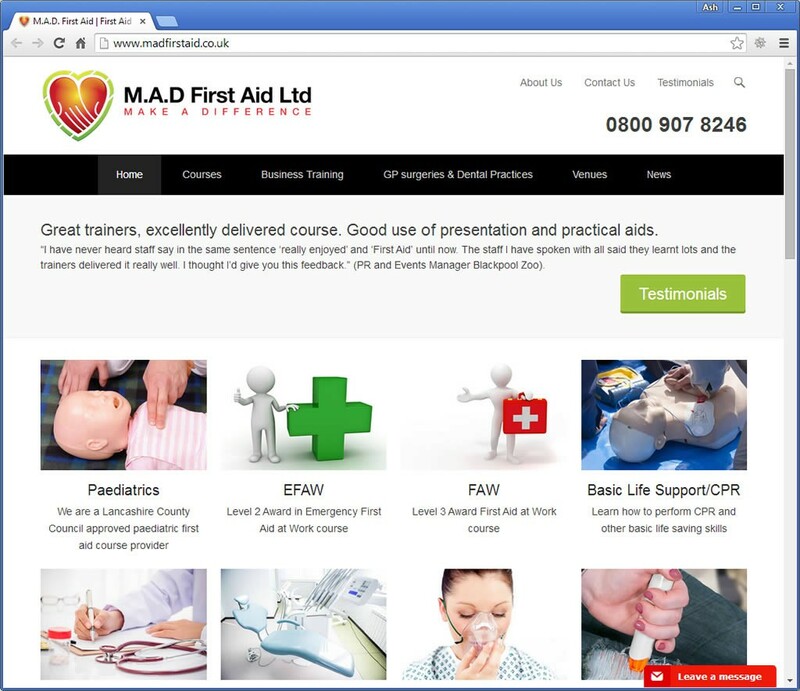 The new MAD First Aid Limited website went live on Friday (16th October 2015)! We’ve been working on it with the during the last month. M.A.D. (…which stands for Make A Difference) are a first aid training company based Walmer Bridge who deliver courses all over the North West of England. The site is based on a popular CMS (Content Management System) called WordPress, which means that MAD First Aid’s staff can modify existing information, add new content and change the layout easily through a web based dashboard. They previously had a website linked to a CMS, but they found it quite limiting when trying the make anything other than basic text content changes. The layout is based on a third party WordPress theme and is a Responsive Web layout that is designed to make the web pages look good on all devices (desktops, tablets and smartphones). Responsive Web Design is about using CSS and HTML to resize, hide, shrink, enlarge or move the content to make it look good on any size screen. This was an important part of the design brief, as M.A.D. First Aid wanted to ensure that there content was easily available on all devices. Be taught by medical professionals. With the right training and support provided by M.A.D. First Aid’s dedicated team you will have the confidence to Make A Difference in a time of need. 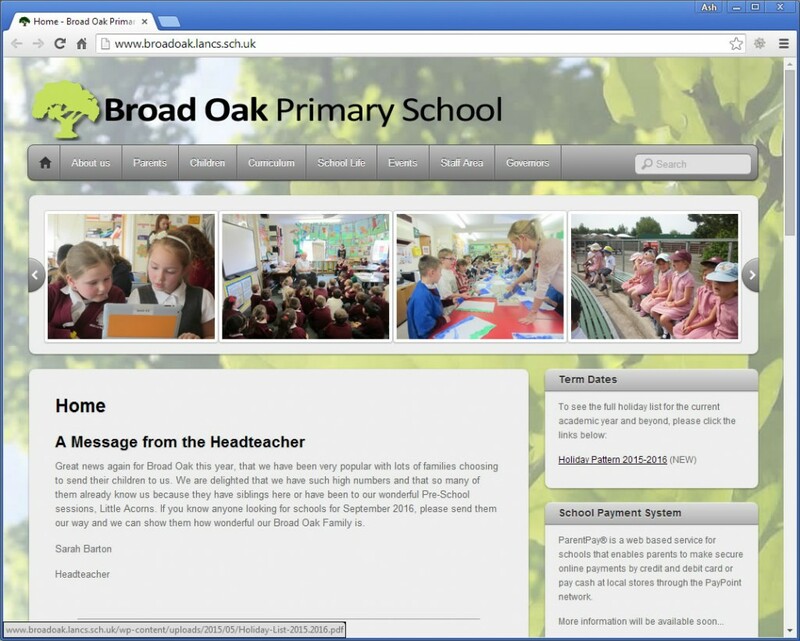 The new Broad Oak Primary School website is live! The new Broad Oak Primary School (Penwortham) website went live yesterday! We’d been working on it with them during the summer – whilst the children were on their holidays! The school had been using a Joomla! content managed website, but the software version was about 6 years old and had become difficult to secure. We discussed the possibilities of an upgrade, but opted for a brand new site on a new system. The site is based on a popular CMS (Content Management System) called WordPress, which means that School’s staff can modify existing information, add new content and change the layout easily through a web based dashboard. The layout is based on a third party WordPress theme and is a Responsive Web layout that is designed to make the web pages look good on all devices (desktops, tablets and smartphones). Responsive Web Design is about using CSS and HTML to resize, hide, shrink, enlarge or move the content to make it look good on any size screen. This was an important part of the design brief, as the school wanted to ensure that there content was easily available on all devices.